SSU’s Caspar Nolte looks to create some offense in the first half against Bluefield. Nolte scored two goals for the Bears. SSU forward Bryce Romanello in action against Bluefield. 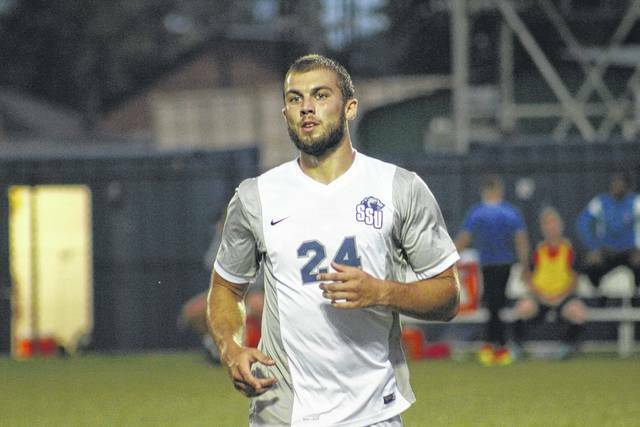 It was a tale of two halves for the Shawnee State men’s soccer team on Tuesday night. Facing the Bluefield (Va.) Rams who entered the game undefeated, the winless Bears were faced with a tall task if they wanted to get their first victory of the season. Shawnee State showed a lot of fight against a very strong opponent, but came up just short by a final score of 4-2. Early on it looked like Bluefield was well in control. The Rams got a quick score from Joao Delgado on a feed from Abel Bogale just 47 seconds after the match started. Bluefield added another score nearly eleven minutes later, when Duarte Ferreria beat the Bears for a score on a pass from the foot of Sando Stalder. 11:48 into the match, the Rams held a 2-0 lead and a ton of momentum. The Rams weren’t done scoring in the first half, however. Delgado scored his second goal of the match at the 30:39 minute marker after Salvatore Viola found him for the goal. It was a tough first half to fathom for Shawnee State, who managed just one shot in the period compared to 13 shots for Bluefield and eight shots on goal. However, the tide turned in the second half, as the Bears were able to create some plays on offense. Shawnee State rewrote the script of the first half, and recorded 13 shots in the second half with six of those on goal. Stepping up the defensive play, the Bears knew they needed some offense of their own to make things interesting at Shawnee Turf. 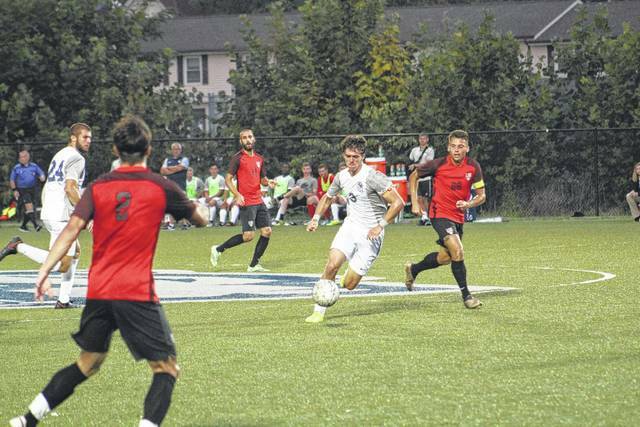 They found that offense almost 25 minutes into the second half, when junior Caspar Nolte scored on an assist from junior Andrew Nimely to draw Shawnee State within two scores. Then, just 20 seconds later, the two connected again to make the score 3-2. With 20 minutes of match time left to play, the Bears had hope. Shawnee State had a shot at pulling off the comeback, but were short on time. With several missed opportunities from the Bears, Bluefield scored on a goal from Delgado with under ten minutes remaining. The goal gave Delgado a hat trick on the day. Ultimately, Shawnee State came close, but lost to Bluefield by a final score of 4-2. With the fight his team showed in the second period, Goodson feels that Shawnee State is heading to the right direction as conference play gets set to begin for the Bears. The two goals scored by Nolte were his first two of the season. He had four goals in all of 2016. The Bears will hope to get more performances like Nolte’s moving forward in order to claim their first victory of the season. “Good effort from the starters and the bench, we’ve just got to keep it up moving forward,” Goodson said. Shawnee State (0-8) will visit Midway University (2-2) on Saturday afternoon.